Most married couples tend to have charming anecdotes about how they first met or what their first date was like but comedian Kumail Nanjiani and his wife Emily Gordon have a bit more to bring to the table when it comes to discussing their early relationship. The unorthodox story of their courtship is the real-life basis for the new romantic comedy The Big Sick, an ambitious and often hilarious film that is also genuinely heart-warming and humane in a way that few companions of the genre can claim to be. Nanjiani and Gordon co-wrote the brilliantly layered screenplay together and the two putting their heads together not only gave the script a balanced sense of perspective but also allowed them to pack in so many rich details that make this true story feel even more authentic. Nanjiani plays himself as a struggling stand-up looking to break out of the Chicago comedy scene with his friends CJ (Bo Burnham) and Mary (Aidy Bryant) while also making some money on the side with a semi-regular gig as an Uber driver. One night, Kumail is accidentally heckled by a graduate student named Emily (Zoe Kazan) and when they meet after the show, it’s clear that the two have an immediate connection and after a few dates centered around viewings of vintage horror movies, they officially become a couple. 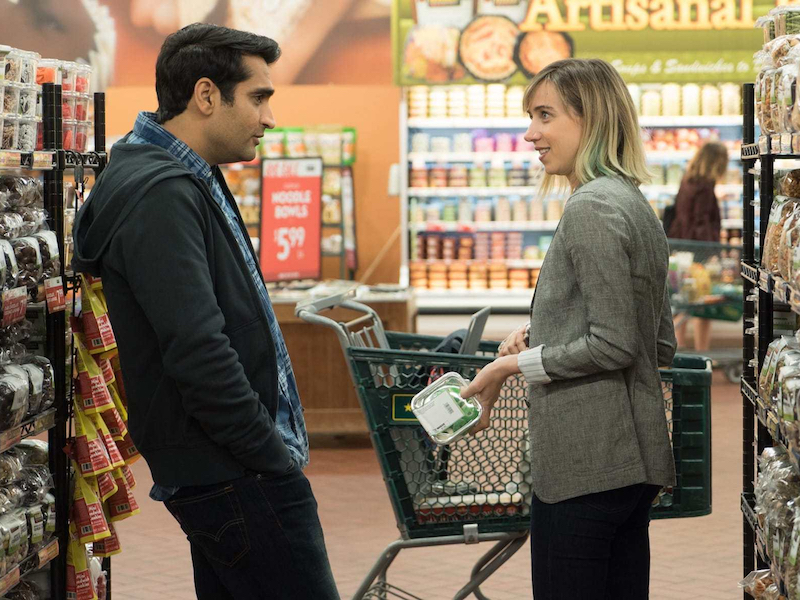 Things are going well until a misunderstanding and ensuing argument seem to derail their partnership but after an unexpected incident following their breakup draws Kumail back into her life, he forms a bond with Emily’s parents Beth (Holly Hunter) and Terry (Ray Romano) that gives him the clarity to renew the relationship. Kumail’s family and their cultural ties factor prominently into his life and subsequently into the story, as their desire for him to settle down with a nice Pakistani girl and pursue a more serious career than stand-up comedy is antithetical to how he’d like things to play out for himself. Even with his differing perspective, Nanjiani writes the roles of his family members in incredibly mature fashion and treats their more conservative viewpoint with respect instead of just throwing them under the bus for easy laughs. There is a harrowing conversation late in the film between Kumail and his parents, in which their Western and Eastern philosophies collide and threaten to do irreparable damage to their relationship, that is likely the most heartbreaking and brutally honest scene I’ve seen so far this year. Director Michael Showalter is probably best known for co-writing sketch comedy touchstones like The State and Stella along with cult classic Wet Hot American Summer but he shows considerable talent behind the camera as he effortlessly manages some drastic tonal shifts. There are so many shortcuts that he could have taken when translating this true story to the big screen and I really came to appreciate just how much thematic ground this movie covered from the persistence of young love to the uncertainty of trying to carve one’s path in the world. At two hours long, it seems like The Big Sick would have a tendency to drag or include more material than is necessary but the pacing is always right where it needs to be and no matter how heavy the story gets, Showalter proves that he can still get a laugh when you least expect it. Much of the humor is there on the page but the credit for the film’s frequent source of laughs goes to Nanjiani’s lead performance, which showcases the comedian’s self-effacing style beautifully while also including tender moments of dramatic poignancy. Holly Hunter does excellent work here as she always does but the biggest surprise to me was Ray Romano, who I had a passing familiarity with based on his Everybody Loves Raymond success but with this role, proves that he’s graduated well past his sitcom roots to offer something more resonant. I’d love if all three were nominated for acting awards come Oscar season but even if they aren’t, I’d be surprised if The Big Sick doesn’t garner some attention in the major categories as a comedy this uniformly excellent doesn’t come around all that often.